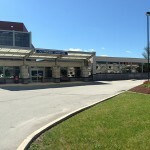 A. Martini & Co. served as the General Contractor for this $7M Emergency Department expansion and renovation project at Excela Health’s Latrobe Hospital. Performing renovations in a working hospital requires extreme vigilance on our part. Unlike a typical occupied interior renovation, we were working around an active systems that provides critical care for hundreds of patients in the building for consultation, triage, surgery and/or recovery. 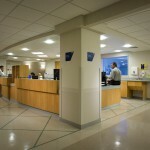 The scope of work for this project included a waiting room, 27 examination rooms and three triage stations, as well as lab and diagnostic service areas, and removal and replacement of the existing slab for the entire renovation footprint. On the exterior we rerouted traffic through a temporary entrance and temporary ambulance bays, until the new canopy was constructed and normal vehicular and pedestrian traffic could resume. Our team communicated daily with the ED staff, facilities management and neighboring departments, to discuss overlay and what was scheduled for the next 24-48hrs. This was in addition to our weekly look-aheads held onsite. 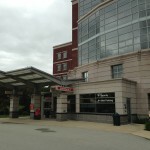 ICRA containment and logistics were priority on this project as adjacent beds within the ED remained open and in-use during construction. 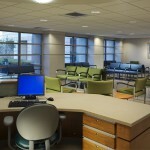 The upgrades to this emergency department were completed in multiple phases, due to hospital usage, ambulatory traffic and coordination with neighboring departments. 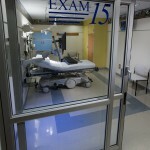 The new area offers the capability for expansion to 50 examination beds, in case of a regional disaster.